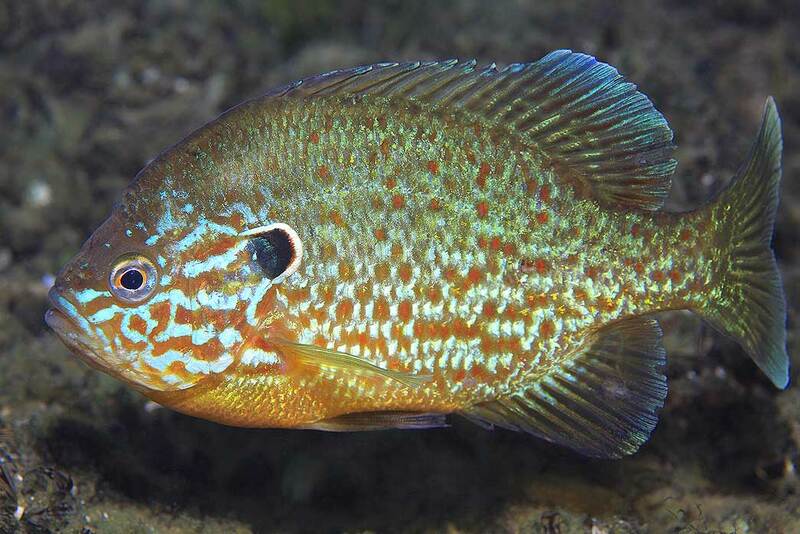 Pumpkinseed sunfish have saucer-shaped bodies with orange or yellow bellies and long, pointed pectoral fins. Their sides are speckled with orange, yellow, blue and green spots with seven to ten faint vertical bars. They have wavy light-blue and orangish-brown lines on their cheeks, and their black gill spots are edged in red or orange. The diet of the sunfish includes mosquito larvae, insects, snails, fish, leeches, mollusks and small amounts of vegetation. They prefer weedy ponds, lakes, rivers and streams. Sunfish can hybridize (the breeding of two species) with other sunfish. The male builds, guards and maintains the nest.